Download "Earnings in private jobs after participation to post-doctoral programs : an assessment using a treatment effect model. Isabelle Recotillet"
Is Temporary Agency Employment a Stepping Stone for Immigrants? 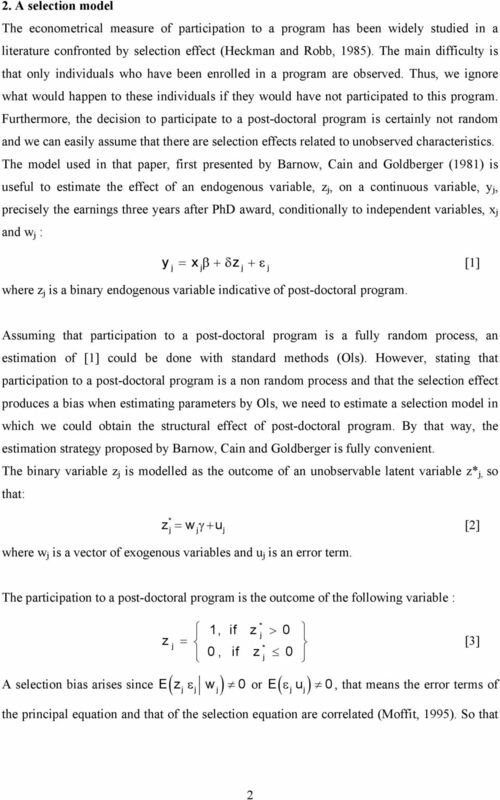 Instrumental Variables Regression. Instrumental Variables (IV) estimation is used when the model has endogenous s.
Children s Working Hours, School Enrolment and Human Capital Accumulation: Evidence from Pakistan and Nicaragua. F. Rosati M.
Enrollment Projections for Nebraska s Medicaid Insurance for Workers with Disabilities (Medicaid Buy-In Program) Mary G. McGarvey, Ph.D.
Do Jobs In Export Industries Still Pay More? And Why? The frequency of visiting a doctor: is the decision to go independent of the frequency? 2. Professor, Department of Risk Management and Insurance, National Chengchi. University, Taipei, Taiwan, R.O.C. 11605; jerry2@nccu.edu. Econometrics II Lecture 9: Sample Selection Bias Måns Söderbom 5 May 2011 Department of Economics, University of Gothenburg. Email: mans.soderbom@economics.gu.se. Web: www.economics.gu.se/soderbom, www.soderbom.net. Wage Determination in High-tech Start-ups Does it Differ for Academic Spin-offs? 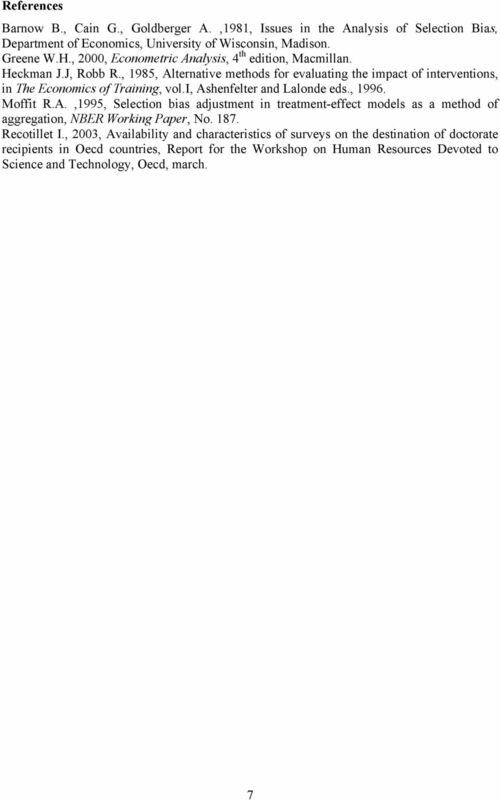 Institute for Empirical Research in Economics University of Zurich Working Paper Series ISSN 1424-0459 Working Paper No. 367 The Value of a Statistical Injury: New Evidence from the Swiss Labor Market. The Loss in Efficiency from Using Grouped Data to Estimate Coefficients of Group Level Variables. Kathleen M. Lang* Boston College. Stock market booms and real economic activity: Is this time different? Wage differentials and disability: discrimination or not? Wage differentials and disability: discrimination or not? Miguel A. Malo epartment of Economics and Economics History University of Salamanca. Edificio FES Campus Miguel Unamuno. 37.007 Salamanca (Spain). 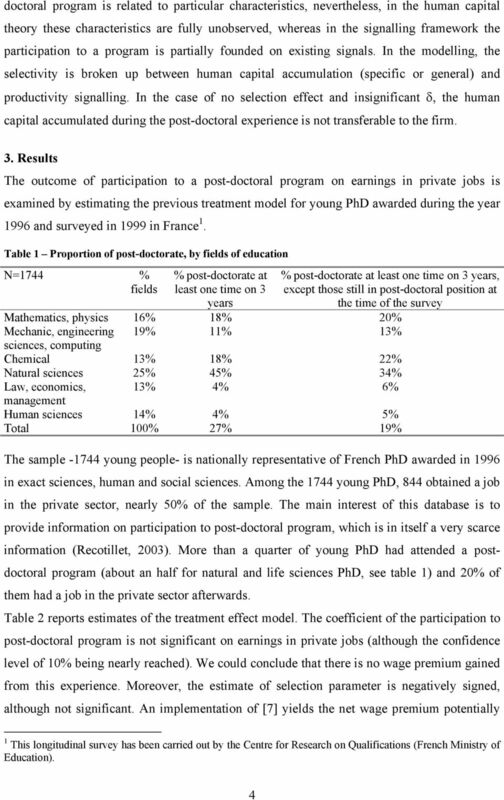 Some background statistical data reflecting on graduate degrees in natural sciences. Post-Secondary Education in Canada: Can Ability Bias Explain the Earnings Gap Between College and University Graduates? Monetary policy rules and their application in Russia. Economics Education and Research Consortium Working Paper Series ISSN 1561-2422.